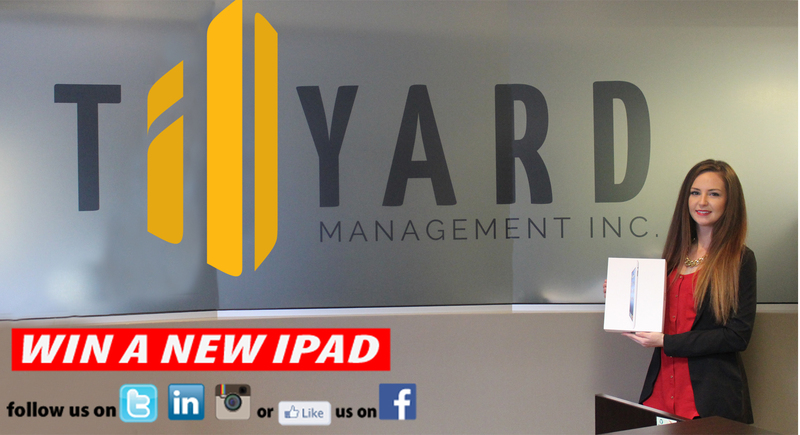 Win a New iPad Air from Tillyard Management! IPad Contest runs January 1, 2016 to February 14, 2016. The Christmas tree is starting to shed its needles and the dreidel has stopped its spinning. The big ball has hit the ground and the cleaning crew is staring at Times Square and wondering where to start. We’re staring into the dead eyes of winter and wondering what we should do until Valentine’s Day. We at Tillyard Management Inc. have decided that we should throw a different sort of party – a social media party! How can we get you all to come to our party? We should give you want you want, what you really really want… Ok, not a date for Valentine’s Day, we’re not working for Cupid over here. How about an iPad Air instead!!?? In order to bolster our social media presence, Tillyard Management Inc. is giving away a brand new iPad Air valued at approximately $500 to a lucky Canadian resident (excluding Quebec) just for joining our party. You don’t have to buy anything, write a catchy jingle, or strain your Photoshop muscles by transferring Kim Kardashian’s head onto the body of a penguin. Just follow us on Twitter, follow us on Linked-In, follow us on Instagram, or like this post on Facebook (feel free to like our page, too ). You only have to follow or like us on ONE of these social media platforms to win the iPad Air. That said, If you like or follow us on ALL of them your chances of winning the iPad Air improve. If you log in with multiple accounts on, say, Twitter, and “like” us as six different people and we figure it out, then you’re disqualified. And please be a real person: Diddly McWinklebutt might not be eligible. Click here to read all our official rules and regulations. The contest starts as soon as you read this post. At some point in the week after Valentine’s Day, all the names of the participants will be dumped into a hat (an application) that picks a name at random. That lucky duck will get the brand new iPad Air. We will announce their name on all of our social media platforms and try to get in touch with the winner that way. If after 5 business days we don’t hear from them, we will pick another name. Happy New Year and Valentine’s Day and all the days in-between from Tillyard Management Inc.